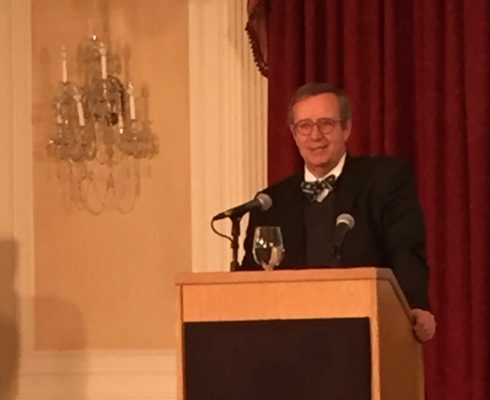 Former Estonian president, Toomas Hendrik Ilves, was named World Leader in Artificial Intelligence and International Cybersecurity by the Boston Global Forum and the Michael Dukakis Institute for Leadership and Innovation, at the third annual Global Cybersecurity Day conference held at Harvard University on December 12th 2017. Pres. 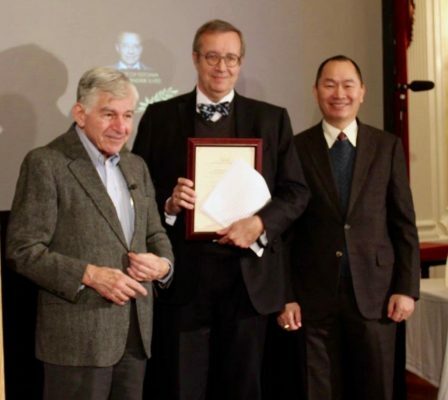 Ilves, who is currently affiliated with Stanford University, was also recognized for his leadership before the United Nations, calling for greater urgency in combating the climate change, the need for safety of the Internet, and the plight of migrants and refugees – especially children. During Pres. Ilves’s term as the Estonian president, his country became a world leader in cybersecurity-related knowledge. Estonia now ranks highest in Europe and fifth in the world in cybersecurity, according to the 2017 cybersecurity index, compiled by the International Telecommunication Union. The country also hosts the headquarters of the NATO Cooperative Cyber Defense Centre of Excellence. 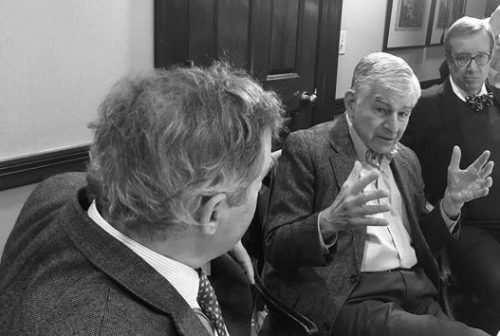 Also honored for contributing to the advancement of Artificial Intelligence and Cybersecurity was Prof. John Savage who was awarded Distinguished Global Educator for Computer Science and Security on the 50 Anniversary of the Brown University Computer Science Department. During his keynote address, Pres. Ilves pointed out that national defense was once based on distance and time, but today, “We are passing the limits of physics in all things digital,” while laws and governmental policies have failed to keep up. He reminded the delegates that 145 million adults recently had all their financial information stolen without intervention by the US government. Protecting its citizens has always been the responsibility of the state and is part of our social contract. “We give up certain rights for protection, but we have been slow to get there in the digital world. When it comes to the cyber world, we are too focused on technology,” instead of policies that will enhance our safety on the Internet. “Estonia’s cybersecurity technology is not advanced, but we are ahead on implementation,” he said adding, “There is a huge difference between what we do and other countries – our focus was not on the gee whiz technology.” but rather implementation of a system that relies on positive identity, which is the foundation of the country’s cybersecurity program. Additionally, all bureaucratic dealings are online and, with assured identity, Estonia has eliminated the need to request personal information repeatedly. Once personal information is on file, Estonian law prohibits any agency from requesting that that information ever again. An Estonian can get a driving license, building permit and register for school without having to fill out the same information repeatedly. By the late 1990s Estonia determined, “The fundamental problem with cyber security is not knowing who you are talking to. 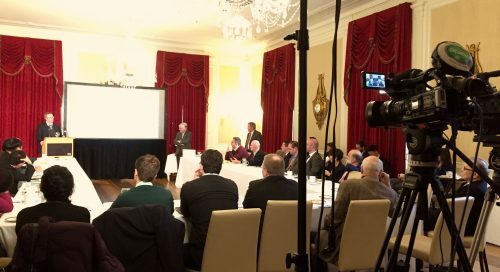 So, we started off with a strong identity policy; everyone living in Estonia has a unique chip-based identity card using two factor authentication with end-to-end encryption.” This is more secure than using passwords which can be hacked. The system is so well integrated that Pres. Ilves claims it streamlines submitting paperwork for various needs to a point where it saves every Estonian 240 working hours a year by not having to fill out tedious forms. Nearby Finland has joined in implementing such a system along with – Panama, Mexican, and Oman. 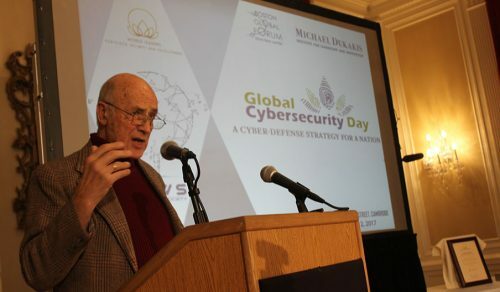 Nye recalled that cybersecurity problems emerged in the mid-1990s when web browsers became widely available sparking the “huge benefits and huge vulnerabilities” of cyberspace about two decades ago. Turning to cybersecurity, global efforts to limit cyberattacks by states, “especially against critical infrastructure” began in 2015 in a report taken to the UN Group of 20 of the world’s most powerful economies; 19 nations and the European Union. In 2017, however, they failed to reach consensus due largely to difficulties between the US and Russian and China backed off as well. While large groups of nations have tended to achieve little in terms of establishing norms in cyberspace, bilateral agreements offer promise. “The US and China have very different views on internet rules regarding [say] freedom of speech. For years the US corporations complained about cyber espionage being undertaken to steal American companies’ intellectual property and giving it to Chinese businesses,” Nye said, recalling that, at first there were denials but the issue became a top priority when the Edward Snowden affair let China off the hook. At that time China totally blocked IP theft. Finally, when XI Jinping and President Obama met in September of 2015, China agreed to no longer acquire intellectual property.” While some IP spying continues on the margins, there has been a discernable reduction since the meeting. The benefit of bilateral agreements Nye emphasized is that, “They don’t stay in a box but become the kernel of the broader game of establishing wider norms,” noting that while broad multi-nation global agreements may have failed, bilateral agreement between states with very different views have succeeded. “Cybersecurity measures also challenge our idea of what’s public and what’s private,” said Reveron noting that cyberspace is monitored and run by corporate entities that are global not national—companies more important than governments,” in defending cyberspace, he said. enhance the cybersecurity of developing countries by making their systems more resilient and their citizens more digitally savvy. A recent paper on the subject Principles for a Cyber Defense Strategy by Derek S. Reveron, Jacquelyn Schneider, Michael Miner, John Savage, Allan Cytryn, and Tuan Anh Nguyen is available on the Boston Global Forum Website. 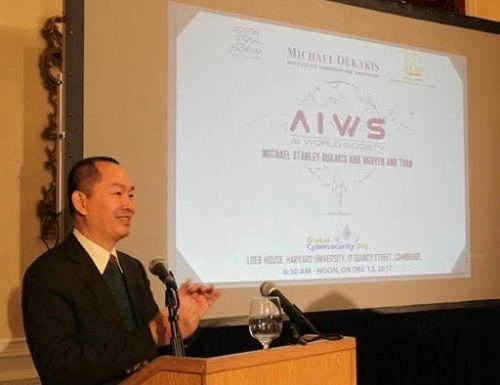 During the meeting, Tuan Nguyen introduced the launch of the Artificial Intelligence World Society, and offshoot of the Michael Dukakis Institute for Leadership and Innovation. Global Cybersecurity Day was created to inspire the shared responsibility of the world’s citizens to protect the Internet’s safety and transparency. 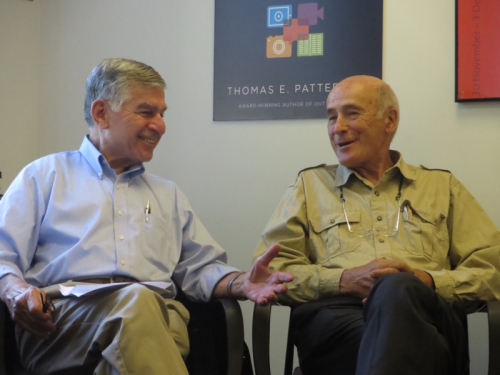 As part of this initiative, BGF and the Michael Dukakis Institute for Leadership and Innovation also calls upon citizens of goodwill to follow BGF’s Ethics Code of Conduct for Cyber Peace and Security (ECCC).